ST. LOUIS -- Is this it? Was Friday night what the Blues are or what they can be? If so, where have they been for the first five weeks? Where has this been? Well, there was a concept that this would take some figuring out, that there would be this feeling-out process implementing new players into the lineup. Joe Pavelski (8) on Friday in St. Louis' 4-0 win at Enterprise Center. Well, it all came together in a 4-0 blitzing of the San Jose Sharks behind another sterling performance from Chad Johnson with a 33-save shutout, one goal and one assist each from Jaden Schwartz and Alexander Steen and an all-around effort in front of 17,032 appreciative fans at Enterprise Center that applauded the Blues' efforts on this night. The Blues (6-5-3), who have won four of five, wanted to get to a style of play that's been inconsistent in the early part of the season, one in which coach Mike Yeo said the players have to get back to a tighter checking game where they're not just in position but tighter in position and harder in position. Yeo said the Blues had been a little too easy to get through, especially gaining entry into the Blues' defensive zone and the Blues had to eliminate some of the time spent in their zone. It wasn't a Picasso, although it's as close to one as can be, one of the finer Blues' all-around efforts of the season, and every part of the game went hand-in-hand on this night, much like the 4-1 win at Toronto on Oct. 20 and much of the 5-3 win against Calgary on Oct. 11. "Well we’ve seen it in glimpses," Yeo said. "I’ve been kind of harping on it that it’s been coming along. We want it to come quicker, but definitely one of our better 60-minute performances. But obviously now we have to build off that." 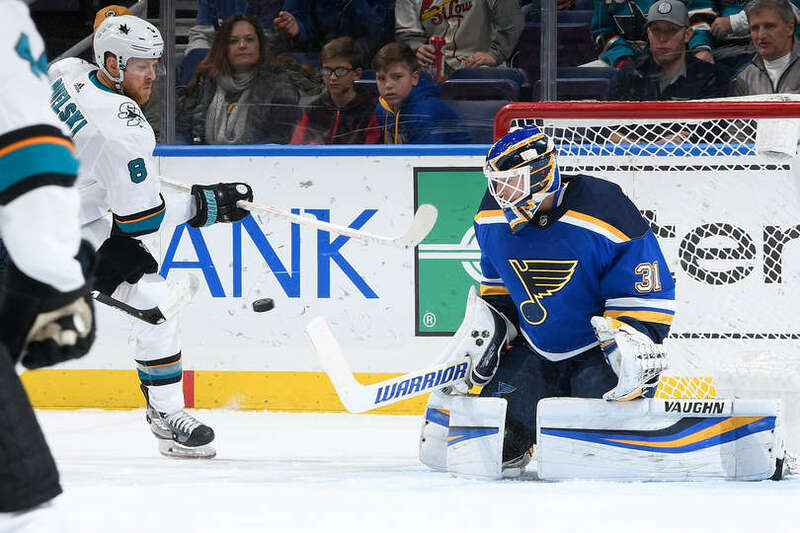 The Blues built it from start to finish against the Sharks (8-6-3), playing the second of a back-to-back but nonetheless with plenty of firepower and star power. "We've been building pretty good," said defenseman Alex Pietrangelo, who got the Blues on the board. "We've done a lot of things, d-zone work the last couple days in practice. You know the old saying: practice makes perfect, but we've done a lot of things and it showed tonight." Johnson showed it also for the second straight game. He's allowed one goal on 72 shots -- made 58 straight saves -- and has a 0.50 goals-against average and .986 save percentage. "I don't really think about being locked in or on," said Johnson, whose last shutout was Nov. 30, 2016 as a member of the Calgary Flames against the Toronto Maple Leafs. "People ask how you're feeling. I don't know. I don't think about how I feel. You kind of go out there. You prepare. I prepare the same way every day. I just try to feel the same way or just not feel at all. You go out there, you work hard, you're focused in the moment, and what happens at the end of the day is the result you get from your preparation. I've been ready to go here and felt good with my preparations throughout the game and I'm just happy to get the two points." "He's a true pro," Steen said of Johnson. "He's always ready to go and he's a very calm netminder. He goes from post to post. He's always big, he always tries to get a piece. He's been terrific for us." 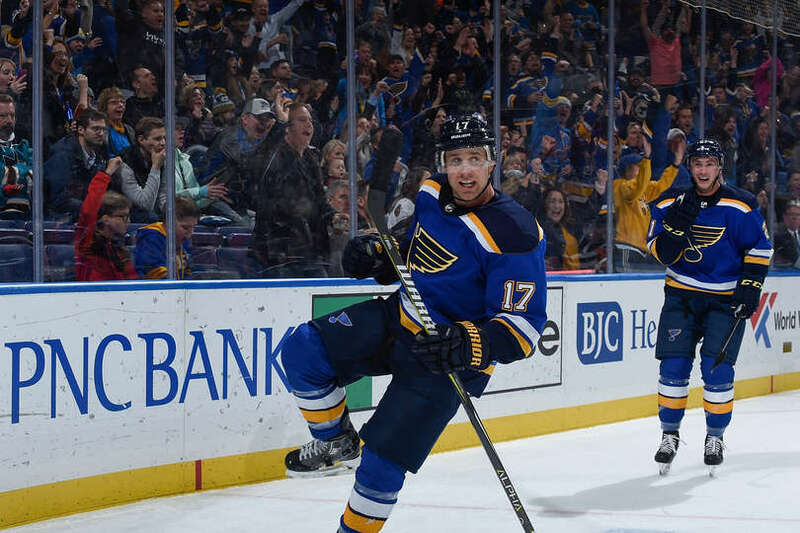 Tyler Bozak got two assists, giving him eight points (two goals, six assists) the past six games after starting the season with a goal and an assist in eight games, and Vladimir Tarasenko put in a workmanlike effort in helping create two goals. Ryan O'Reilly extended his point streak to a career-high nine games (eight goals, eight assists) after scoring. He became the first Blue since Doug Weight did it Oct. 4-25, 2001 to get a nine-game point streak in his first season with the Blues, and Tarasenko extended his point streak to six games (four goals, four assists). "I thought it was definitely a step in the right direction," Steen said. "I think 'Johnny' made some big stops for us, timely stops. I know he makes it seem easy but there are some big saves he made tonight." Playing 4-on-4, Pietrangelo sniped a shot from the slot after Tarasenko worked to get the puck back behind the net. He initially tried to center it, but had to work it back to his stick, found Pietrangelo in the slot before waiting out Sharks goalie Aaron Dell and picked his spot top shelf at 14:50 of the first period. "Sometimes when you have too much time, you over-think it," Pietrangelo said. "I think all the guys kind of shifted to one side and they got the goalie ... I think their own guys were kind of screening him. You don't get that much time very often, but I'll take it." The Blues kept pushing the pace in the second, working in the San Jose zone and being able to work pucks out of the defensive end when Johnson wasn't called upon to keep the puck out of the net. O'Reilly made it 2-0 at 5:28 when Schwartz stick-checked Logan Couture behind the San Jose net, Tarasenko slid the puck to Schwartz in the low slot, and Schwartz pushed the puck to O'Reilly to the left of Dell before putting it off the San Jose goalie and plunging into the top half of the net. Schwartz's goal at 13:57 was a work of perfection and made it 3-0. The Blues gained the zone with 7:21 remaining in the period, and the line of Robby Fabbri, Robert Thomas and David Perron did most of the heavy lifting keeping the puck in the zone, forcing two failed clearing attempts before San Jose iced the puck with 6:20 left, and when the Blues won the faceoff and Vince Dunn kept the puck in the zone, 17 seconds after the faceoff, Bozak was feeding Schwartz in tight. "Even my goal, Vladi won the puck battle behind the net. Schwartzy's goal, it's just hard work," Pietrangelo said. "When you're using everybody in every situation, you're going to have a little more jump like we did tonight. We're going to score goals and win games based on our work and we've won four of five here, whatever it is, and a lot of that's coming from our work." San Jose pushed in the third, but Steen scored on a busted play at 12:21 making it 4-0. Johnson had to make a flurry of saves in the waning seconds to preserve his eighth NHL shutout. "I think when you get wins you build confidence and confidence in the structure and the way that you play and there's definitely areas we can improve on but again, you have to find ways to win even if you're not playing your best," Steen said. "We've done that lately here, the last five games, and again, finding ways to winning, whether it's guys stepping up or a team effort or finding ways I think you build confidence and I think we're doing that and getting more a little bit more flow with our team. It's an ongoing thing, I think, being able to deal with the highs and lows. Teams that can get through that are usually the better ones." Instead of harping about a statement win, Yeo wants to see this type of play followed up. goal gave the Blues a 3-0 lead en route to a 4-0 win over San Jose Friday. "This has been as long of a homestand that I can remember and got a chance to finish it in a good way Sunday," Yeo said. "So it’s important for us to play well at home. Obviously for the success of the team and the organization you need that, but obviously you want to put a good product on the ice for our supportive fans. So yeah, let’s make sure we bring it on Sunday now. "I think it’s maybe a game we can build some confidence off of. I think we have to be careful. They played last night. I think that we did a nice job … as far as the game plan, using that to our advantage, making it hard on them to go back to retrieve pucks, making them come 200 feet. I think that we played a smart game because of that and I think that helped us a lot. There was a lot of good in the game, (but) I think the next one would be a little bit more of a statement for me, to be honest with you. If we can beat two good teams in a row, now you’re talking. Tonight was a good game, I’m really happy with it. Obviously we worked to get the win and I’m proud of the guys for that. But if we can get the next one and beat two good teams in a row, then that’s saying something." And for those fans, who showed their appreciation, well, Pietrangelo put it eloquently. "We know we've got good fans," he said. "We can hear them. It's great. What is it, Friday night? Friday night in St. Louis. Everyone's a little fired up, huh? Get the day off tomorrow. "Well they like the play, too. I guess it's a combo, right? A little AB [Anheuser-Busch] on Friday night in St. Louis and there you go." * NOTES -- Center Brayden Schenn missed his second straight game with an oblique strain. He is expected to practice Saturday and a determination will be made whether he can play in the final of a season-long seven-game homestand Sunday against Minnesota. ... With his two points, Steen passed David Backes for sixth in franchise history in points with 462.